Dry practice is an excellent way to maintain your firearm manipulation skills—particularly when you cannot get to the range. However, many unintended discharges occur in dry practice due to improper safeguards (see the picture at the right). Step one in preparing for dry practice is to follow the safety rules (note: I do not use the term dry fire—we don’t want the pistol to fire!). These rules apply every time you handle a firearm. To start your dry practice: Unload your pistol in a different room from the one where you plan to dry practice. I always use the mnemonic MRI (magazine, rack, inspect) for loading and unloading. I -- Inspect: Visually and physically confirm that the pistol is in fact unloaded. Place the unloaded pistol in a holster or case for transport to the room where you plan to do your dry practice. There must be no live ammunition in the same room where you are doing dry practice. During dry practice always aim the pistol at something that can safely absorb the most powerful round that your pistol can fire. Level IIIa body armor (even old body armor) hung on a coat hanger over a door is great for this purpose. Other things such as a full bookshelf with no airspace, a wall known to be solid (e.g. an exterior brick wall), or dedicated devices such as the Safe Direction™ dry-fire backstop (a more expensive alternative) all serve as proper dry practice backstops. It may or may not be a good idea to practice trigger-pulling and reloading in the same session. If you follow the steps outlined in this article 100% of the time without fail, then doing both in one session constitutes little risk. However, if you have any doubt—then dry practice reloading and trigger pulling in different sessions. 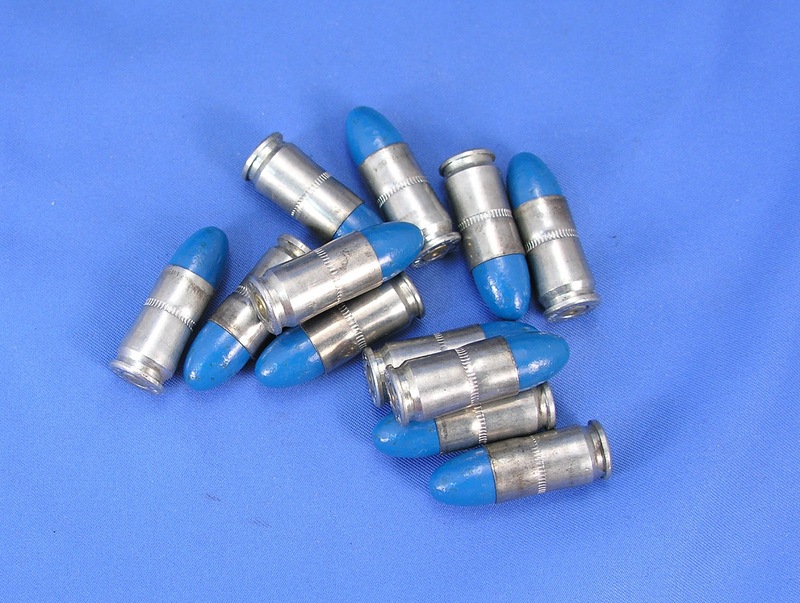 When using dummy ammunition, absolutely ensure that no live ammo has migrated into the “dummy cartridge” supply—keep them separate at all times. I designed some heavy-duty dummy training rounds that replicate the weight and feel of live ammunition. To ensure that I did not mix live ammunition with dummy training rounds, I use steel cases with a heavy cannelure to ensure the bullet does not set back in the case when chambering. I also load them with blue bullets. The heavy cannelure and the colorful bullets serve as visual indicators that these are dummy rounds. I personally never shoot steel-cased ammunition and I know of no manufacturer that produces steel case ammunition with blue, green, or red bullets. If you wish to purchase a set, click here. After a dry-practice session, do not immediately reload and holster for carry and never do this in the room where you are dry practicing. When you finish, say out loud: “I am finished dry practicing” three times. I know it sounds corny; however doing this resets the mind to the fact that “draw gun, pull trigger” dry practice is finished. When you are finished—YOU ARE FINISHED. Never do one more draw. Place the pistol in its case or holster and return to the room where you unloaded the pistol and safely reload for carry or put the pistol away. I did one more draw once and the plaque shown in the lead picture above was the result. The metal section is part of an ironing board leg and the wood behind it was a section of wall panel. I shot the ironing board leg with a .357 magnum and the bullet ricocheted off and struck the wall panel. Fortunately, there were no injuries to anyone except me—my injuries were ringing ears and extreme trauma to my pride. 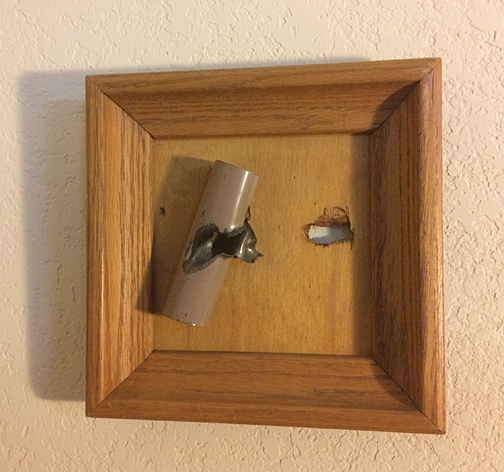 My father made the plaque for me as a permanent reminder not to cut corners. Excellent reminder. Thank you for sharing the lesson. As you may know, I work st http://wew.CoolFireTrainer.com, where we make recoiling laser barrels. Safety is just one of the benefits, because our replacement barrel requires you to remove your factory barrel out of your semiautomatic pistol. No live barrel means no chamber, thus no possibility for sending one down the pipe. The combination of safety from an NA, realistic recoil and mechanical behavior of the gun, negligible cost per shot, and anytime/anywhere convenience makes CoolFire Trainer the ultimate dry fire training tool.